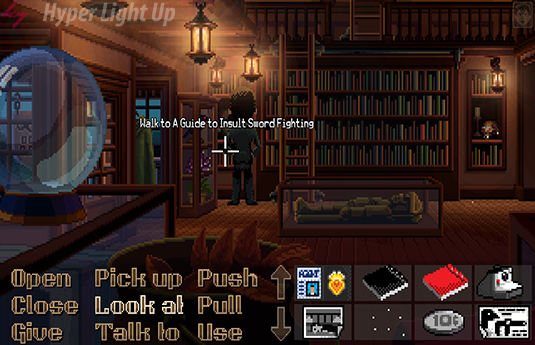 Say you are new to the point and click adventure genre and you don’t know that the names Ron Gilbert, Gary Winnick, Maniac Mansion or Monkey Island mean. You saw that there was a buzz around Thimbleweed Park and you thought that you should check what all the fuss is about. Well my dear reader, welcome to a game that should have a motel sign with the arrow pointing at it, saying “Old School Adventuring Right Here”. The two gentlemen I mentioned above are responsible for two of the most influential video games in the history of our favorite hobby. Sometime in 2014 they decided to bring that old school adventure spirit back to life, turned to Kickstarter for help and the response from the people was amazing. 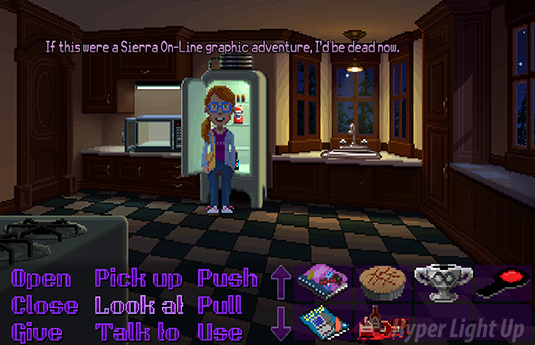 The result of course is Thimbleweed Park, a homage to every adventure game trope we grew up with. 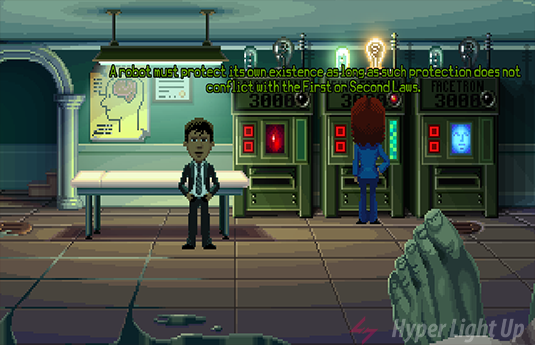 There is a murder in Thimbleweed Park and agents Reyes and Ray have been called to investigate the body before it completely pixelates. They will have to explore the almost ghost like town, interact with the remaining citizens that seem they don’t really care that there’s a dead body in their backyard and find out what happened at the old pillow factory. In the game you will be able to control up to five characters with their own goals each (that appear on their to-do lists), interchange on the fly between them, sharing items and combining them to solve puzzles. Each one has a back story that offers greater understanding behind the town and the relationships of the people. The game does a great job of handling five playable characters and it definitely isn’t overwhelming as it might sound in your head. As far as gameplay goes, in the game there are nine verbs that represent the actions that you can do in it. You can Look At things, Pick Up, Open, Close stuff etc. You do everything with the mouse, picking a verb and then clicking on the item you need to perform an action. Items you pick up are stored in your inventory and you can combine them with other items or give them to another character. At the top right of the screen you will see all the characters that are available and you will be able to change between them. There is a tutorial in game that explains how everything works so don’t worry, you won’t stuck (at least for that reason). The visual art of Thimbleweed Park is very good. High quality pixel art that will definitely take you decades back in time. There is a strong Monkey Island vibe in the game, from the way the characters animate to even some of the backgrounds. It’s like a new world that feels somewhat familiar because you’ve watched a documentary before, or saw a picture of it somewhere. The Monkey Island feel carries and to the kind of humor and conversation choices you have in the game. 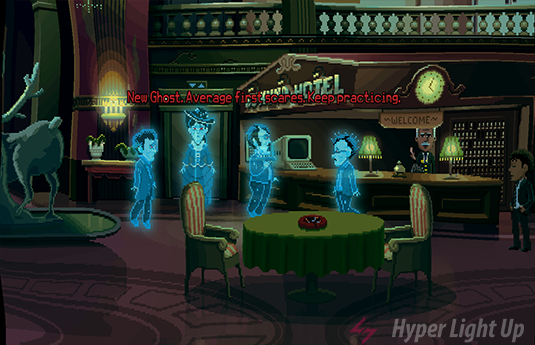 The game is self referential, sometimes breaks the fourth wall and gives witty choices to the player. Unfortunately most of the jokes don’t really hit home. There are a few reasons that I believe are responsible for why that is happening. Firstly, the voice acting is not good. Most of the times it falls flat, sounds like the actors just performed one sentence without having the context behind the conversation. There are some exceptions where secondary characters actually do a good job but when your main characters, that you listen for the duration of the game, feel like they just reciting something without passion or the emotional connection the words carry, then it becomes tiresome. Then, there are some choices that they do not fit the actual character. There are some things that I cannot imagine them saying, given what I know about them and their assigned voice. I would prefer if it was a clear cut between who is who and what conversation choices each one has. Finally, the writing on the little things is not always that good and it feels like it is aimed at a younger audience. It is not that witty as you might have expected. Though there were some times that the jokes hit hard and really laughed out loud. It’s just that, that didn’t happen that often, it felt like a spike of awesomeness that wasn’t constant. On to the puzzles now, and if you are looking for a challenge, then you will be very happy with what Thimbleweed Park offers. There are two game modes, casual and hard. If you don’t have that much free time but you like to be challenged at times, then choose the former. If you need the actual adventure game experience, definitely go hard (mode) on it. There is a lot of pixel hunting to be done and Thimbleweed Park makes fun of itself, having the player collecting specs of dust, actual pixels that you can keep in your inventory. Besides that, make sure you search and pick everything, even if it seems unrelated with your current task. The great thing is that most of the puzzles are logical and you might find yourself already having the solution in your mind before trying stuff. There were a lot of times that I was thinking “Yes, I have this item and I need to do this action to remove this part, I need to find something like this and put all of them in that place”, and most of the times it actually worked. But there were a few times that, not only it didn’t, but had me stuck in a puzzle for hours. I was playing on hard mode and there was a certain phone number that I needed to find in a certain tunnel. This was the premise and I promise I won’t spoil anything. I was given four names and I had to find a number by studying them. I tried stuff like looking to the phone booth, using the first letter of each name on the phone dial to make the call, I rearranged the order of the names, I even tried numerology, to see if there is an assigned number behind each name. Fun stuff but pretty frustrating because that puzzle made one of my characters unavailable and for my second character to progress, he needed to obtain an item from a store. But to solve this puzzle I needed both of my characters! I was in an actual impasse. I will let you figure out the solution and the rest of the puzzle solving, and I will move to something so awesome that I believe not even the developers of Thimbleweed Park know that they have in their game. In the game there are a lot of easter eggs, references to other games and to pop culture. I am about to explain one of the best pop culture references that was an idea of the backers. Let me explain. 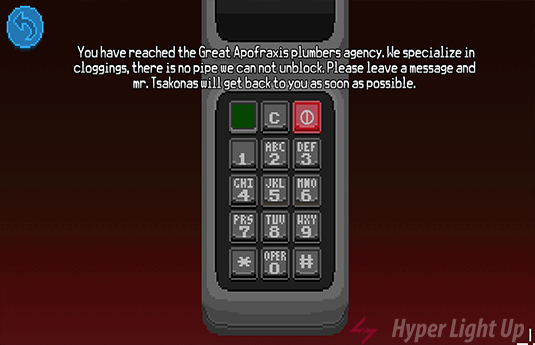 One of the stretch goals of the Kickstarter gave the option to backers to have their name in the town’s phonebook and if they wanted, they could record a voice message for when the player would call the number. There are A LOT of names in the phone book and you can spend hours just calling names and listening to their messages. I am from Greece and I was showing the game to my cousin, explaining him how cool this stretch goal was. We were riffling through the phone book pages and looking for greek backers, calling them and listening what they left on their answering machines. We were amazed when at some point we saw a familiar name : Kostas Tsakonas. Here’s a little backstory : Kostas Tsakonas was one of the biggest cult comedic actors in Greece, back in the ‘80s. One of his biggest cult VHS hits was a movie called The Great Apofraxis, where he was a plumber dealing with people and situations around his work, that often ended with us, the viewers, dying in laughter. When my cousin and I first saw the name on the phone booth, we looked at eachother and thought “No way…”. Then we called the number and this message appeared. Fun fact, the movie was released in 1987. Thimbleweed Park takes place in 1987. This is how when the public gets involved in a video game in imaginative ways, can take the whole project to another level. I really don’t know if the developers knew the existence of the movie or if they knew how meta Thimbleweed Park can become, at least for the people of a small country in Europe. Great thumbs up to the backer who thought of this. By the way, besides the phonebook, there is a whole library with thousands two page books, written by backers. Imagine what you can find in there. You can buy Thimbleweed Park on Steam for the price of 19,99€. If you are looking for a pure point and click adventure experience in 2017, this is it. The whole feel of Thimbleweed Park, from the visual style to the way you solve puzzles brings back memories from times long gone, but not forgotter. If you are new to the genre then there’s a casual mode for you. Don’t let the bad voice acting and a bit of frustration get to you, keep trying and you will be rewarded.